Work Clothing with logo from Calendar Lady Promotions offer you a wide selection of different styles for various different companies. From overalls for garage staff to T-shirts and polo shirts for leisure businesses all embroidered with your business details and company logo. All clothing items are stylish and displayed with your embroidered logo. Why not browse through the Calendar Lady Clothing department to view more of our range. Here at Calendar Lady Promotions we are expanding our whole company which includes our Clothing with logo department. We have a wide range of different products from baseball caps to work overalls, all with your company name and logo embroided on the front. So have your details advetised on our Clothing with logo today. For more details of all of the other products here at Calendar Lady Promotions besides our Clothing with logo click here. We are able to customise all our items with your company logo. We offer a comrehensive printing and embroidery service to ensure that your products will be clearly advertising your business details and company logo. So use our embroidery service on our Clothing with logo from Calendar Lady Promotions. For more information, prices or samples on our Clothing with logo click here and fill out the contact form and we'll get straight back to you. Here at our Clothing with logo department we have your company details and logo embroidered onto the garment or cap that you choose in any quantity that you like. 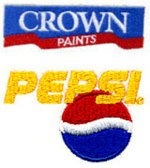 Here is a sample of the embroidery with a very famous brand name for example only. Clothing with logo is a excellent way to promote your company as with your staff wearing the clothes makes them a walking advert for your business.